This building was once home to a colourful sea captain called John Macgregor Skinner, who lost an arm in the American War of Independence and an eye while serving with the Royal Navy in the Caribbean. You can read more about him on our page about his memorial column, erected in Holyhead after he was washed overboard and drowned in 1832. 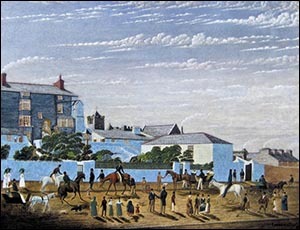 The painting on the right shows Stanley House, in the left background, at around the time of Captain Skinner. You can view the original at Holyhead Maritime Museum. If you’ve just scanned the QR codes outside Stanley House, you’re standing at the opposite side of the building to the one shown in the painting – the side which overlooks the harbour. The painting is the work of customs officer James Sparrow, a friend of Captain Skinner. The figures in the foreground were Captain Skinner's local friends or people who benefited from his kindness and charity. Their names are inscribed on the painting’s gilded frame. Stanley House was built early in the 19th century by the Stanley family of Penrhos, major landowners in Holyhead. The gable wall nearest to St Cybi’s Church includes part of a Roman wall. Stanley House has been home to a solicitors’ practice since Victorian times, and possibly even earlier. Today the practice here is H Jenkins and Hughes. In the early 20th century, Stanley House was also the office of the Agricultural Organisation Society’s North Wales branch. In 1913, the society teamed up with the London & North Western and Cambrian railway companies to take an egg demonstration train to towns across North Wales. It included three saloon vans in which farmers were shown how to improve production, collection and marketing of eggs, for the table and for poultry breeding. Pamphlets in Welsh and English were available for distribution from Stanley House.